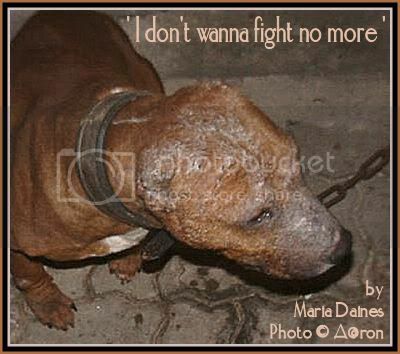 Chain Space was written and recorded after watching the BBC Panorama documentary on the shocking, distressing and criminal world of dog fighting 'Dog-Fighting Undercover' broadcast in UK. One of the men involved in fighting with dogs was asked if he was sorry that his dog was so badly injured that he destroyed it (a brutal death by electrocution after being doused in cold water, this failed on the first attempt due to a power cut) The man's answer to the question was no, he wasn't bothered by losing his dog, he simply stated that it would give him more 'chain space' to get another dog. They think it's good how we go down and taste our blood. Play this game of killin' dogs against the law. Thanks to Marybeth Daines for backing vocals. Our thanks to Mary Alice Pollard, Cornwall's Voice For Animals, for creating the banner art for this project.